Look at this picture. This picture is taken in the toilet of a cinema in Chelsea, but trust me, I could have taken it lots of other places too. At home for example. Or at work. Or in a cafe. 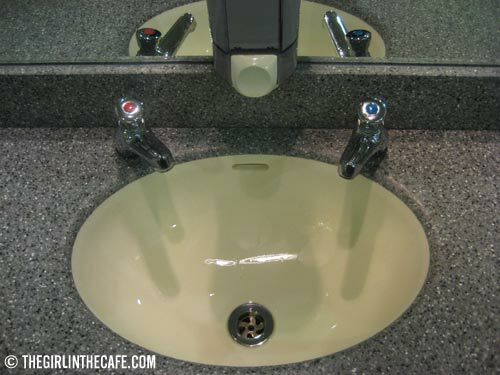 Why are there 2 separate taps for hot and cold water? And why are they so far apart that you have to move your hands from burning hot to freezingly cold? I accept driving on the wrong side of the road, drinking tea the Milky Way, bangers and mash, I even accept Marmite – but this I don’t get. Please help me out here. Easier to plumb, I suspect. I’d blame it on the famous British sense of humour. And the solution is easy: always carry your own personal sink plug. Simply plug sink, mix water to achieve the perfect temperature and wash hands. It’s funny, it’s pretty much the same in Singapore – they were colonised by the Brits so maybe that’s why. I blame it on the British humour as well. Look at the great symmetry. I do in fact recall a number of times (in the beginning of my stay here) where I either burned myself or had a very cold shower because they have changed the position of the taps too! You got to love them, really. So I guess the hot tap is for the Tories and the cold one is for Labourmembers??? It must be so hard for people with compulsive behavior to decide which one to close first…..